Wee Lil' Blog: More Fun Halloween Finds! Plus a giveaway!! More Fun Halloween Finds! Plus a giveaway!! 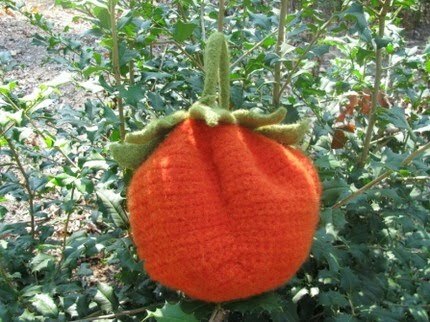 In my quest to find some fun Halloween items, I came across a couple Trick or Treat bags that are just so cute! Here's what's written about the bag in the description: "This purse pattern is relatively easy, crocheted in the round with numerous increases and decreases to give it its shape. The finished purse measures about 12" from bottom to handle tip. Width is about 11 inches and depth about the same. This bag is great for a purse or a trick or treat bag. Pattern includes instructions for adding a jack o lantern face." If you really love this bag and don't want to (or can't) crochet it, you can always send a convo to the store owner, Polly, to have one made by her and listed especially for you! And it gets better! Polly is offering a mini-version of this purse as a giveaway item to one of our blog readers!! If you'd love to win, tell us your favorite thing about Halloween in a comment on this post. At the end of the month, we'll choose a winner using random.org. The winner will receive their prize straight from Polly. Thanks so much, Polly! 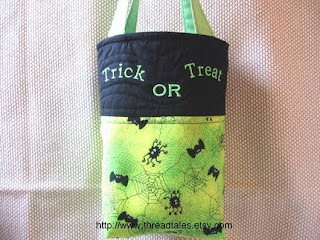 Here's what's written in the description about one of the bags: "This item was $19.99, now 15.99This unique trick or treat bag is made of lime green and black cotton fabrics. The lime green embroidery thread pops against the black quilted fabric on the upper half of the bag and spells out Trick or Treat. Bats and spiders with ghoulish eyes float over spider webs on lime and yellow cotton fabric on the lower half of the bag. The bag measure 9 ½” Wide X 10” High (not counting the straps) X 4” Deep. To insure that the loot makes it home, the 19” straps have been reinforced and topped stitched. The bag is fully lined, and the polyester batting along with the 4” bottom gusset allows the bag to sit up on its own. Use this bag to collect your loot on Halloween night, or tuck the straps inside and fill to the brim with candy for a unique center piece. Take it to work filled with candy and make nice with your customers, employees and co-workers." And even better, this bag is on sale this week as I'm writing this post for you! I hope you loved the bags I found! If you do, go order a couple for Halloween and Trick or Treat night, it'll be here before you know it! Happy Monday everyone! See you tomorrow.